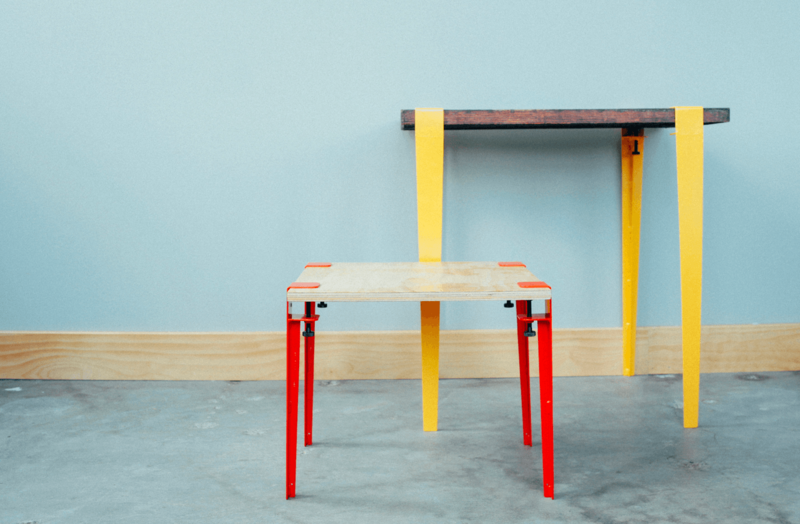 Hot on the heels of his hugely successful Kickstarter campaign, designer Kyle Hoff is back with a new, improved, and more colorful version of the Floyd Leg — his stunningly simple invention that can transform just about any flat object into a table. For those of you who might’ve missed it during the crowdfunding stage, the Floyd Leg is basically a flattened C-clamp with a leg protruding from the bottom. It looks like something of an oddly-shaped monkey wrench. The idea is that you can clamp three or four of them onto any slab of material, and voila! You’ve suddenly got a freestanding table in front of you. Hoff hatched the idea for the legs about three years ago. At the time, he was living a somewhat nomadic lifestyle — traveling to different cities for work and school on a fairly regular basis, and in each new place he landed in, he found himself buying and discarding furniture rather than taking it with him, which wasn’t exactly ideal. He needed something that was easy to pack up and move around with, and after his searches for such a product came up empty, he decided to build his own. A few dozen prototypes later, the simple, elegant Floyd Leg was born. With this minimalist and highly-accommodating design, the Floyd Leg allows you to put together a makeshift table in just a few minutes, and since the surface material can be practically anything, you’re free to find something that fits the decor of your space. Reclaimed barnwood, old longboard decks, a simple piece of glass; it’s all fair game. The legs (which can be affixed to materials up to 2.25 inches thick and 75 pounds in weight) are now available in a range of different colors, including vermillion red, pastel blue, saffron yellow, and the original black and white. They also come in two different sizes (either 16 or 29 inches tall), making both coffee tables and dining tables a possibility. Starting this week, you can buy a set of four Floyd Legs for either $179 (16 inch) or $189 (29 inch). That’s admittedly a bit steep for a set of glorified C-clamps, but if you like the idea of making table without going through all the trouble of sawing, drilling, sanding, and screwing it all together, this is exactly what you need. Find out more here.